Do you enjoy doing work on your bed? Perhaps you like shopping but can’t deal with the constant heat of the laptop on your lap. We’ve dedicated this article to find the best laptop stand for bed. You’ll want to find out which ones are best for heat resistance, adjustability, and comfort. Another great reason to pick up a laptop stand is you’ll be able to use these on your current desk. 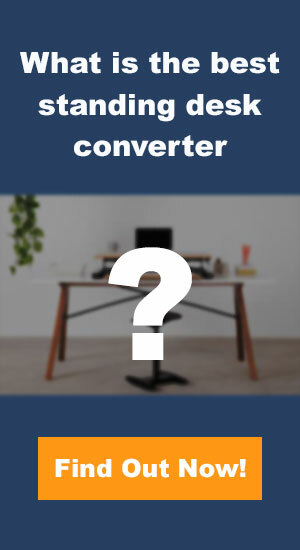 If you have a standard desk, these can be as a simple sit to stand desk converter. Keep in mind, this list of the best laptop stands are portable and have foldable legs. It would not be recommended to use the lap desk for long-term, as it may cause some discomfort because the legs are folded under the table. Not ranked – or put in any particular order. Skip to the bottom for my top 3 picks. We’ve awarded the Avantree adjustable laptop table for bed as best design because of the modern finish of black and grey wood on the surface of this product. Perfect for the minimalist home or office. The best feature of this desk is the range of laptop sizes you can fit on this tray, up to 17 inches or larger can be comfortably placed on this tray, while also having a large range of height adjustable for those who want to be able to make sure they are always comfortable. This desk also features two auto-lock buttons on each side easily enable quick changes in height (adjustable from 9.4″-12.6″) in addition two clamps may be used to adjust the surface angle (from 0-30 Degree), so you will be able to easily adjust to your comfort levels. 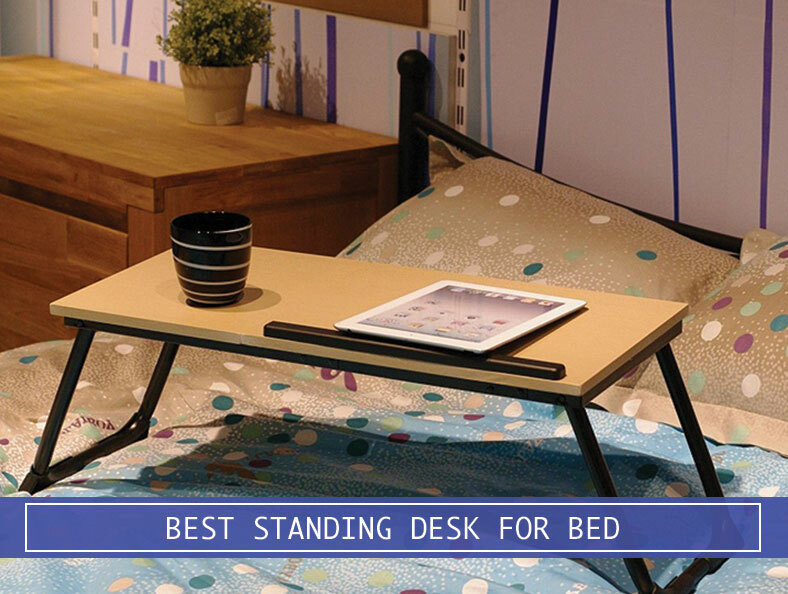 This light sturdy laptop stand for bed is ideal for those who want to be able to store away this portable tabletop and be able to use it in only a few seconds without any hassle or needing to make any adjustments to find your right comfort level again. The design is what makes this option stand apart more than any other option on the market. If you’re looking for something sleek for your lifestyle, this is the choice for you. Overall customer opinion is overwhelmingly positive, almost 5 stars from most websites, this adjustable desk has been a positive alternative for those who really care about the way a product looks and feels. The only issue that has popped up from reviews around the web is the fact that many individuals did not expect that this product would be as big as it is, but that can easily be avoided if you simply double check the measurements before purchasing. Fits 17″ laptop without a mouse. Laptop stand measures 20.5 x 11.8 x 0.35 inches. Adjustable height: 9.4″ – 12.6″. This Cooper Cases laptop desk has a roll out tray that you can use for your phone, coffee mug, or any additional stationary tools that you need to keep you productive and organized. In addition to the pullout tray, this laptop stand has also a book stand that you can tuck away under the portable riser. This is great if you just want to relax after a long day at work, and lay on your bed while catching up on your favorite book. Not only does this laptop tray is great for the bed, but also great anywhere else that you may need to sit down and do some work. It also has a neat strap that will allow you to carry around. One thing about this stand is that it does not have a stopper like others, which may or may not be ideal for some people. A stopper can be good if you don’t want your laptop to slide down, but it can also be annoying for some people who want to just write on a flat surface. However, Cooper Cases replaced the stopped with a rubber material that has an ergonomic cut out to help it from coming off the edge. This has a larger surface area, not quite as large as a standing desk converter, which is typically around 30-36″ in width but is a decent sizing for what it is. One thing to note about this riser is that it is not as adjustable as the others, however, it is still a quality stand that can be used for anything up to 88 lbs, which is quite a heavy load. The iCraze is an easy and adjustable laptop bed tray that has dual fans to keep your laptop nice and cool so it doesn’t heat up too fast. It is easily compacted and can be used anywhere you go, whether you need it on your bed or even going to a coffee shop. This portable laptop stand is great when you feel like you need to be ergonomic while working. What’s also cool about this laptop bed tray is that it comes with a mouse tray so you don’t need to use the laptop’s mouse for very long. In addition, you’ll be able to rotate the tray to your preference because it has a 360-degree rotational joint. The iCraze is great for those that need space just for a laptop, while the other bed laptop stands are larger, which makes this product more of a value buy. The NEARPOW Laptop Bed Table is our runner up! This adjustable desk is amazing in all aspects but it does have different qualities compared to our best pick. This adjustable desk is XL, one of its best features. While we don’t recommend that you use a regular size PC with this tray while in bed, we will say that the amount of space and a weight capacity of this product has really blown our minds. This desk offers a high-quality product made out of sheet material, aluminum and silicone for the best experience possible. Another great feature is the stopper at the edge of this adjustable laptop table bed, so when you’re adjusting the angles of the surface area, your mouse and laptop won’t slide down. This foldable laptop stand is fully assembled so you won’t have to spend hours trying to figure out this product before you can use it. The desk comes with two auto lock buttons on each side that can easily be adjusted for 5 different heights, as well as adjustments that can be made to the angle of the tabletop surface. In terms of what the customers think, many are very satisfied, whether they’re using this portable tray for the bed, couch, traveling, or even using it as a delicious breakfast meal in bed, customers feel comfortable when using this product. The only suggestion that was found in the reviews left by customers was focused on the height and it being unable to be adjusted easily. While this might be a problem for some, it can easily be fixed by adjusting your desk or propping yourself up to have proper posture (designed for this specific purpose, to have better posture). This laptop stand for bed measures 23.6 x 13 x 2.32 inches. 3 different table angles (0 to 45-degree) tilt. 5 different heights stretching between 9.4″ and 12.6″. Warranty: 30 Days Money Back Guarantee, 24 months warranty. 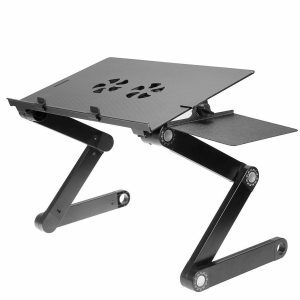 The Dinger Adjustable Laptop Table is one of the best overall picks out of this list. Not only is this option a number one best seller on Amazon, it’s also extremely versatile in its function. The best feature of this adjustable laptop stand for the bed is the versatility in its unique design. Because of its lightweight tray, you’ll be able to easily carry this tray without any problem. By also being able to easily extend the legs of this desk, you’ll find stability for any laptop on the bed or at the office. 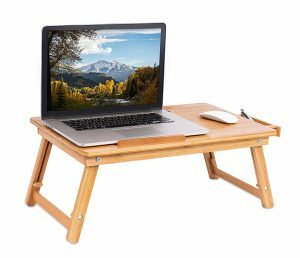 This laptop table can be tilted to different angles to aid in your comfort, between 0 and 45 degrees, you will have various options on how you adjust this tabletop for your maximum comfort. Two stopper protects your laptop from skidding while tilting the top, an extra soft wrist rest provides a good comfort on your wrist while working. 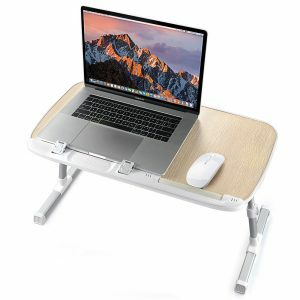 Use this adjustable laptop desk on a regular height desk and stand up to work instead of sitting at the keyboard for hours, it will help with alleviating neck and back pain. Most customers are extremely pleased with this product, saying that the cheap price isn’t even reflected in the high-quality product. 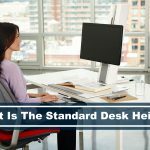 Many individuals love their new adjustable desk for home or in the office, some have found it difficult for certain laptop sizes but that can easily be fixed by making sure you review the measurements before purchasing. Because of this wide range of possibilities, you can bet we’ll be recommending this tray. Fits 17″ laptop with mouse space. Laptop table measures 23.6 x 13 x 2.4 inches. Adjustable leg, stretching between 10″ and 13″. The Smart Options adjustable laptop stand for bed is one of the most budget-friendly options on the market right now, with a bonus free tablet stand. This modern design of the tray can really bring a new element into your bedroom space. Many customers have loved this product and use it daily and have touted this product as being one of the best investments they’ve purchased. This simple and sturdy desk is perfect for those who want a cheaper option without sacrificing any of the quality. The surface area can hold up to 150 lbs, this unit can fold flat, and there is a built-in safety ledge for extra security. But the biggest difference compared to all the other portable folding desks on the market would have to be how budget friendly this option is. While it might be necessary that you purchase stoppers so your electronics don’t slide around, this desk can easily be customized to your liking and for the cheap price, we would agree that it is the most budget-friendly option on this list. Laptop table measures 20.5 x 11.6 x 2 inches. The SUPERJARE Laptop Table comes in third place on our list simply because its unique design might not be for everyone in the market. The best feature of this desk is its rustic design and added storage, but it might not catch everyone’s eye in a positive way. Some might feel like this desk is not modern enough for their tastes because it looks a bit dated in some variations of the design, but you’ll be pleasantly surprised with this product if you’re looking for something simple and to the point. Customers overall have rated this product 4.5 stars with over 500 reviews, many are happy with the design and the sturdy building. This tabletop option is one of the best options out there for those who want a quality product. This unit has built-in stoppers to help your laptop or papers from slipping, plus if you use this as a stand-up desk, then you’ll be happy to know this product prides itself in helping to diminish wrist, back, and neck fatigue. If the design isn’t the right aesthetic for your tastes, we suggest looking over the different color options just to make sure, because you will be able to choose between two different looks for this relatively cheap alternative to standard standing desks. Fits 15″ laptop with space for a mouse. 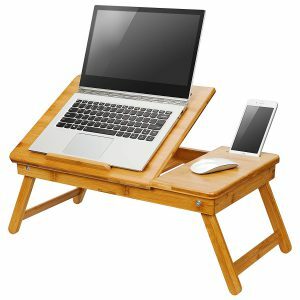 Laptop table measures 20 1/2″ x 11 13/16″. The table can tilt between 0 to 36-degrees. Although these risers are great for the bed, as we mentioned it in the introduction, also there’s a lot of great uses for these. Even if you don’t want to invest in a standing desk converter, some of these laptop trays can be used for that, this way you don’t need to spend over $200 for a stand. In addition, these are great for those that have smaller spaces where a full desk can’t be placed. Another idea is if you want to turn a typical standard desk height at a coffee shop into a standing desk. Or perhaps, you just want to use these for food. Whether your reason for getting a portable laptop is for small spaces, DIY standing desks, or food, you’ll be happy that you’ve invested in one of these trays because of its ergonomic, portability, and convenience. Design does make a difference and design isn’t just the way a product looks, it also includes how functional it can be. Do you want something that has added storage or do you want a product that is simply a tray without any added bonuses? It’s important that you really choose something that will work for you and your unique situation. Don’t settle for something that won’t be utilized. 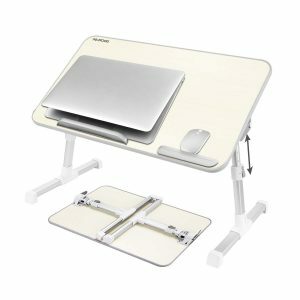 Are these adjustable laptop bed stands easy to move around? 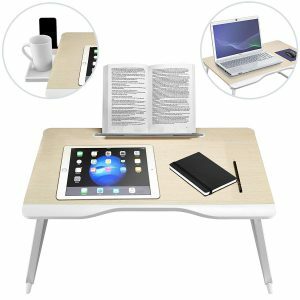 There are generally two different kinds of portable bedside desks; the simple tray design that you place over your lap on either side or the rollable tray customized that can be easily moved. While it might be hard to figure out exactly what will work the best for you when you’re buying something online, these two very different models should be considered. 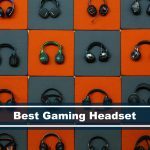 In this review, we’ve tested the ones that you just place on the side. Will a bed desk make me lazy? While you shouldn’t just go for the cheaper option all the time, it should be considered if you really think that you won’t utilize this purchase after you recover. You need to ask yourself if you will actually find a use for this product after the reason you purchase it is no longer an issue. If you’re buying this product and you don’t have a health issue that isn’t a factor in this purchase, then refer back to the first buying frustrations that will apply to you more. If health isn’t the driving force behind this purchase and you just want to purchase this desk for working in bed, that’s completely fine! But when you work in your personal space it’s been known to cause a lack of motivation and less productivity. While some people work like this just fine, it’s important that you really try to estimate if you would still be just as productive when using this product in your day to day life. Some individuals have a very niche purpose as to why they would need to purchase a portable adjustable desk for the bed like this. Usually, this purpose revolves around health issues that require a ton of rest and being off your feet. While these desks are great for this unfortunate purpose, it can be quite frustrating to spend extra money on something you know you won’t use in a few months after recovering. We suggest donating it to your work office for those who need assistance in times of need so they would be able to borrow it if needed. 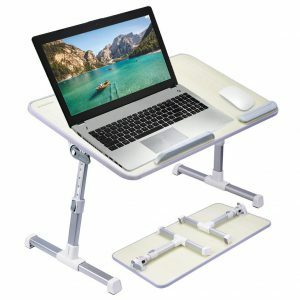 While most of us today in the modern world do own a portable laptop, it can be quite frustrating when you can’t use a full-size computer that you use for all of your work essentials on a portable adjustable desk for your bed. While for some this might not be a deal breaker, having to work on a such a small laptop screen can be just another pain we probably don’t want to deal with. The benefits of owning a portable and adjustable laptop standing desk for the bed are great in numbers. Right away when using a product like this you’ll notice how great it is, especially when you’re dealing with a health affliction that causes you to be bedridden. This product can open the doors for so many individuals who want to be able to take charge of their life again. Being able to accomplish and complete work goals and being able to create with endless possibilities on a comfortable and easy to use the product, lives will be forever changed. 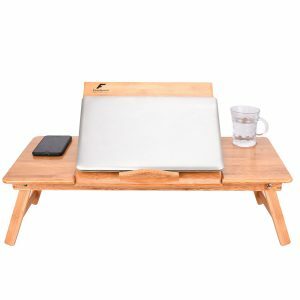 When looking through the products we’ve mentioned today, our top favorite would have to be the overall best pick, The Avantree Adjustable Laptop Table. It’s simple, to the point, and can easily transition from the bed to the office without any negative thoughts. How Does it Blue Light Computer Glasses Protect Our Eyes?